First, in the interests of full disclosure: I am a huge Mike Birbiglia fan, and have been for years. His blend of self-deprecating humor and spot-on social (and occasionally political) commentary make him one of my favorite stand-up comedians working today. I’ve been looking forward to this movie since I first heard about it. I have the album it’s based on (like his other albums) virtually memorized. That’s always a risk — it’s easy for big fans to be disappointed. 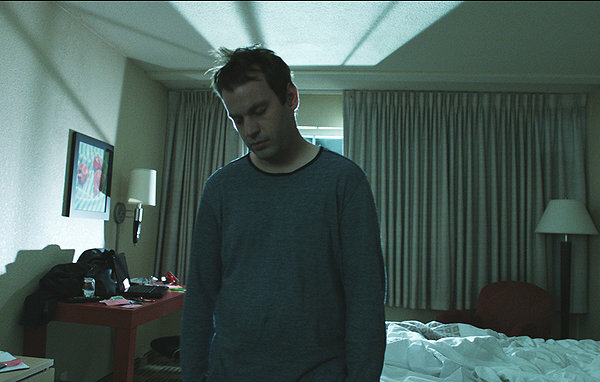 “Sleepwalk With Me” is loosely based on Birbiglia’s life (the “loosely” is emphasized by having him play “Matt Pandapiglio” rather than himself) just before his career took off. The film simplifies the stories from his album of the same name, honing them down until they’re a single, unified story: Matt, a struggling comedian, is under a world of pressure. His girlfriend-since-college Abby (Lauren Ambrose) wants to get married. His career is going nowhere. All the stress is making him walk in his sleep, and not in harmless ways, either. What starts out as him kicking a hamper because he’s dreaming there’s a jackal in the room progresses to him taking scalding showers and accidentally destroying furniture. Birbiglia and Ambrose have a comfortable chemistry, the kind you’d expect from a couple who are still together after eight years, even though they probably shouldn’t be. The supporting cast is large and the right kind of funny, from Matt’s relentlessly negative father (James Rebhorn) and gossipy mother (Carol Kane) to his snarky friends. Of course, Birbiglia himself has to carry the film, and he does not disappoint. The bits of comedy he does early in the film are perfect — so perfect that I’m almost hesitant to praise how bad they are, because I could easily believe they are the actual jokes Birbiglia did back when he was first starting out. They don’t make a lot of sense, and the blank looks of the audiences he tells them to just drive it home. Those of us who know all his bits thoroughly may be a little bummed at what gets left out of the film (the “don’t tell anyone” bookending story from the “Sleepwalk” album is one of my favorites and I was sad it didn’t make it into the movie), but seeing Birbilia’s tales brought to life is worth a few minor disappointments in service of the plot. Folks who aren’t familiar with Birbiglia’s work are in for a treat. Even if you’re not that interested in stand-up, this is a story almost anybody can relate to. Matt refuses to deal with his problems in real life, until his subconscious starts acting up so badly that he can’t ignore how stressed out he is anymore. Thankfully, most of us don’t have a REM disorder to contend with, but a girlfriend who keeps TiVoing “Wedding Story” and “Baby Story” or hopes and dreams that just aren’t coming together are far more common. If you’ve seen or heard Birbiglia’s work and liked it, do not miss “Sleepwalk With Me.” If you haven’t, you still shouldn’t miss it. Folks who hate first-time directors (Birbiglia co-wrote, stars in, and directed this feature), laughing in recognition at people’s foibles, or comedies about relationships should probably stay away — but I’d recommend they take this opportunity to broaden their horizons and give it a shot anyway.